.NET Core is a free, open-source, cross platformed, managed software framework for Windows, Mac and Linux. The .NET Core 2.1, which was announced on 7th May 2018 during Microsoft Build, is now publicly available as production ready build. If you want to know what's new in .NET Core 2.1 and from where to download the latest .NET Core SDK, checkout this post. .NET Core 2.1.0 supports the following operating systems/platforms: Windows Client: 7, 8.1, 10 (1607+), Windows Server: 2008 R2 SP1+, macOS: 10.12+, Red Hat Enterprise Linux: 6+, Fedora: 26+, Ubuntu: 14.04+, Debian: 8+, SLES: 12+, Open SUSE: 42.3+, Alpine: 3.7+. Make sure that, you are running either of them before downloading and installing. What's new in .NET Core 2.1.0? 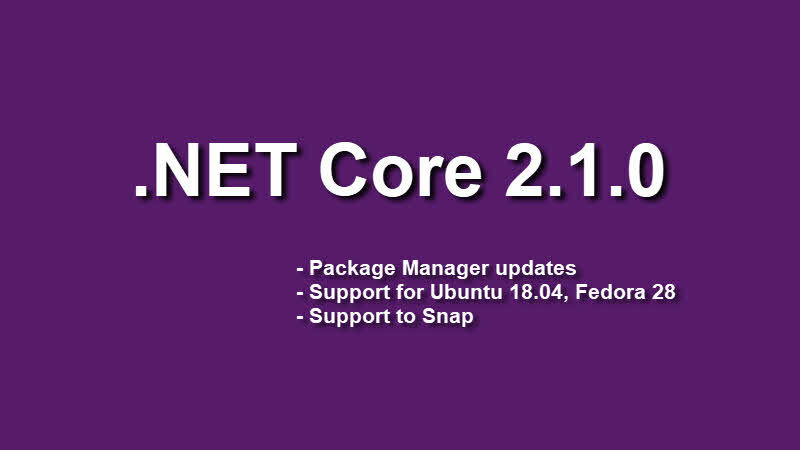 The .NET Core 2.1.0 installer now supports package manager updates functionality. The .NET Core 2.1.0 is now available for Ubuntu 18.04 and Fedora 28. Microsoft brings .NET Core to Snap, which is an emerging application installation and sandboxing technology. You can now configure a process to use the older HttpClientHandler either from the AppContext class or from the config file. You may like to read: What's new in ASP.NET Core 2.1.0? and What's new in Entity Framework Core 2.1.0? If you have come this far, it means that you liked what you are reading (.NET Core 2.1.0 SDK is now available for download).